Every year, a state from India is selected as the theme for the Surajkund Crafts fair and the entire ambience is designed accordingly. For 2012, Assam was the theme for the fair. Besides, showcasing handlooms and textiles, artistes and troupes from the north eastern state performed traditional dance forms. Organized annually by the Haryana Tourism Department in the month of February,the Surajkund Crafts Mela is a delightful handloom and handicraft fair. 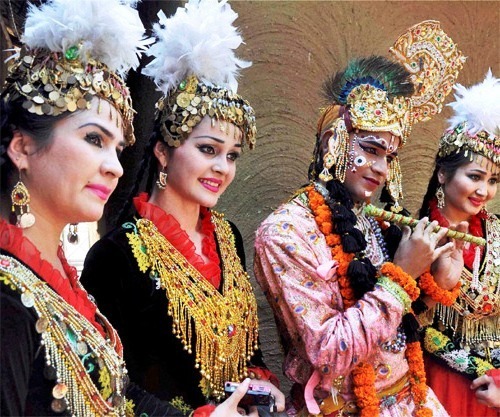 It is planned every year to promote the traditional Indian Handicrafts in a rural environment at Surajkund in Faridabad, about 45 minutes drive from New Delhi. Organized for the first tme in 1981, the Surajkund mela has come along way is today a strong platform for Indian artists and craftsmen to not only display their skills in the arts and crafts field but also to promote handicraft production and sale. Khurja ,approx 90 KMs from Delhi has developed into a center for Ceramic Mugs. The cluster of small industries, kilns etc produce brightly colored ceramic mugs somtimes with exquisite designs.The prices were quite reasonable at Rs 300 (US$6) for 6 pcs. The art of making blue glaze pottery came to Rajasthan via Kashmir. The name comes from the eye-catching Persian blue dye used to color the clay. TheJaipur blue pottery, made out of Egyptian paste, is glazed and low-fired. The colour range is restricted to blue derived from the cobalt oxide although other non-conventional colours, such as yellow and brown are sometimes included. The cotton kurta tunics and kurti tops are all hand-crafted in India. (People from India were the first to grow cotton!) Kurtas are available in a wide range of textures, colors, and sizes. These beautiful Indian tunics and tops are very comfortable and great for any season. Over the centuries, each region in India developed its unique style of wooden structures, carvings and inlay work. The states of Jammu and Kashmir, Uttar Pradesh, Gujarat, Karnataka and Kerala figure on this list.Some of the most common motifs engraved wooden items are flower pots, a variety of flowers, parrots, peacocks and pigeons, besides deer, horses and elephants.This particular piece was being sold for Rs 100,000 or US$2000. In Madhya Pradesh the artisans work on different varieties of wood – teak, dhudi, sal and kikar with great sensitivity and skill, turning them into fabulous works of art. The famous wooden articles of Madhya Pradesh are painted and lacquered toys boxes, bedposts, cradle frames and flower vases, to name a few. Gwalior, Sheopur-Kalan, Rewa and Budhni are the main centres of wood lacquering in the state. The fair is not only limited to exhibitions of artwork but also presents the visual delight to its visitors in the form of special folk dances and musical evenings at the open-air theatre.Surajkund Mela offers opportunities to experience the traditional dances and folk art forms of India. The musical evenings at the open-air theatre are a high point of the fair.Troupes from all participating countries and Indian states take part in the musical evenings. The 2012 Mela witnessed the participation of Thailand,Congo and Central Asian republics like Tajikistan, Uzbekistan and Kyrgystan besides the seven SAARC countries. Artists and artisans from Congo and Central Asian republics like Tajikistan, Uzbekistan and Kyrgystan participated and performed in the fair. Kashmir is famous for Pashmina, Shahtoosh and woollens. Among other fabrics silk and tweek are also very famous fabrics of Kashmir. Indian Handmade Bags have become trendy and are known for their lively and vibrant colors which have the power to spice up even an ordinary outfit. The trendy handmade bags come in a variety of designs, shapes and colors and suit ladies of all ages and styles. These statuettes are crafted using natural stone that are procured from the best quarries of the country.Depending on the location in India the craft has evolved over the years. Sculptre was an integral part of Indian Temples built by various rulers over the centuries and local clusters developed having skill in working on the local stone available. These wooden toys are first handcrafted from wood and then finished using lacquer and color.The coloured lacquerware toys have provided entertainment and knowledge to village children for centuries. The Tajiks share language,culture and history with Afghanistan and Iran and 90% of this Central Asian country is covered with mountains.In the 20th century Tajakistan became a part of the USSR and later got its independence after the breakup of the USSR.Weaving is the most popular craft of Tajakistan. Hansiba is the fashion brand of STFC which represents thousands of women with precious skill of hand embroidery & craft. Named after Hansiba, SEWA’s first & senior-most artisan and an inspiring symbol of everything the organization stands for it showcases some of India’s timeless embroidery skills. The Arts and crafts of Thailand enrich the country's cultural heritage and add to the traditional history of Thailand. Thailand has always enjoyed peaceful regime and this has helped the growth and development of its rich heritage of art and culture. Arts and crafts in Afghanistan consist mainly of sculpture, pottery painting and rug making. Afghanistan is world famous for the crafting of ornate rugs and carpets. National arts and crafts occupy a prominent place in the cultural heritage of Uzbekistan. The national arts and crafts include engraving on copper, wood, and plaster-based material; jeweler's arts; carpet making; ceramics; ornamental embroidery, gold embroidery; decorative currying of tanned leather; silk spinning; making of decorative braids; inlaid works on musical instruments; painting on papier-mache; creation of decorative boxes for local tobacco; baskets, cradles, chests, and many other types. Throughout the centuries, handing down of artistic traditions from one generation to the next has never stopped. Brass,Onyx and Wood Crafts, Carpets and Weaving, Furniture, Jewellery , Leather and Pottery.These are the crafts which have developed in the area from the Mohenjo Daro times. The Maldives Crafts consist of Wooden Lacquerware, Boat Building,Mat making from dried colored reeds,art calligraphy and wood and stone carving. Bhutan has 13 traditional arts and crafts which are known as zorig chususum and are deeply rooted in Budhist philosophy.besides being highly attractive and deorative,the arts are symbolic and relate to 13 different subjects. When in Delhi stay at our Airbnb Reunite In Delhi. Groups of upto 8 people can stay. Hi. Pls let us know what all handicrafts you are exporting by putting your web site or ecatalog link over here.